Umeboshi is a typical traditional Japanese pickled food, alcohol-disinfected and salted Ume, Japanese plum. 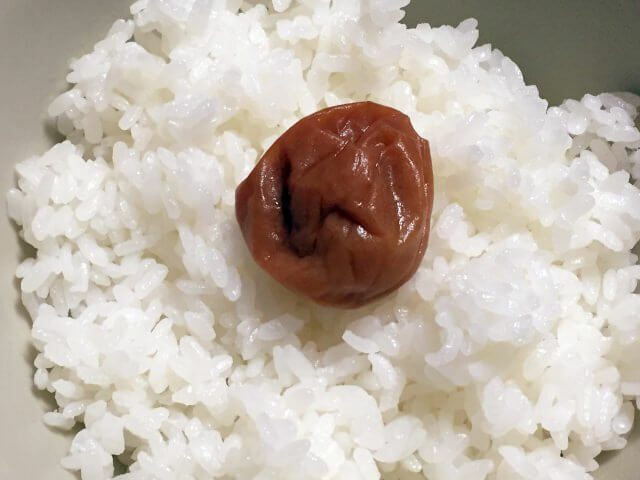 Originally from China, Umeboshi was initially used as medicine. In Japan, Umeboshi was found from the ancient ruins that built at around BC 200. Ume vinegar, which is made from Umeboshi, was also very important for ancient people since it was used to disinfect ancient weapons, cuts, and derust parts of buildings or statues. 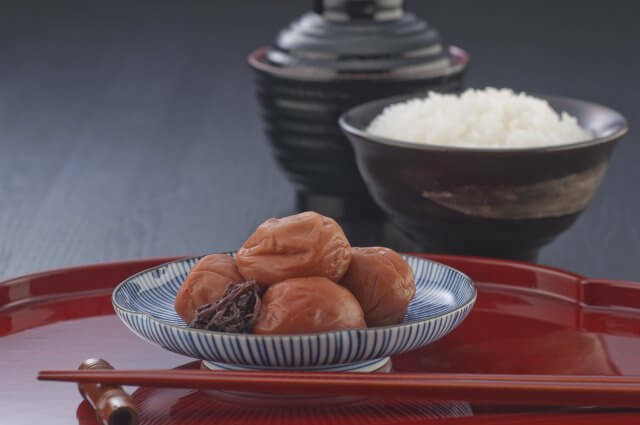 During the civil war era, Umeboshi was a staple food for samurai warriors as it could be preserved for long periods of time and eating Umeboshi is said to combat fatigue and have antibacterial properties as well. 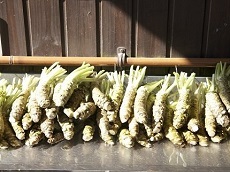 The way Umeboshi is prepared has changed over the years meaning the taste has changed as well. Umeboshi used to be much more sour, the ume fruit was bigger, and rarely went bad. It is even possible to eat Umeboshi that is a 100 years old granted it is in good condition. The oldest Umeboshi in Japan is kept in Nara prefecture, which was made in 1576, and it can be eaten still now! 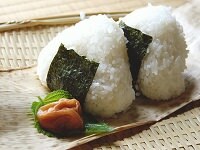 On the other hand, Umeboshi prepared nowadays is mild and not as sour, usually pickled with fish seasoning or honey. Umeboshi have great health benefits such as aiding digestion and absorption, helping recover from exhaustion, disinfection, and keeping other foods from going bad. 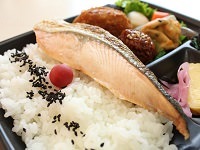 As Japanese traditional bento box, people make Hinomaru-bento, which means rising sun bento, put an Umeboshi on center of white rice, which remind people red and white colored Japanese national flags. 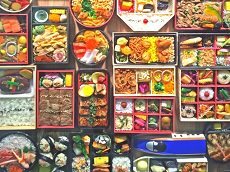 This Hinomaru bento box is not made for just representing Japan’s national flags as people put Umeboshi in bento box since Umeboshi has power to disinfect and keep other food from going bad. Interested in trying umeboshi while in Japan? Pick up a bento box lunch for your tour bus or shinkansen ride between Tokyo & Kyoto and try the sour Japanese pickles out for yourself! 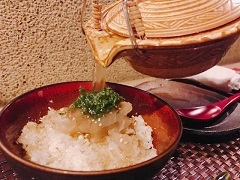 Okayu is a popular dish made with rice and water, often topped with other ingredients. 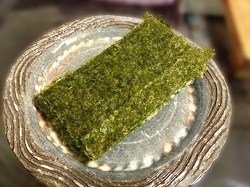 Nori is a type of edible Japanese seaweed, popular in Japan. 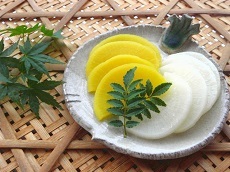 Tsukemono means pickled vegetables in Japanese. Surrounded by ocean, Japan developed its tsukemono culture in a unique way. 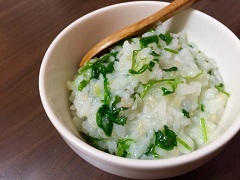 Chazuke, bowl of rice with green tea poured in. It's Japanese soul food!